Women's Contemporary Celtic Necklace : LOVE2HAVE in the UK! A women's contemporary Celtic necklace. 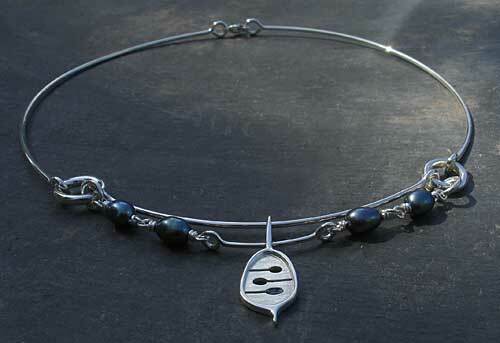 This piece is the matching silver wire necklace to match the modern Celtic bracelet with enamel detail on our website. It is the only piece of wire jewellery that we sell. Wire jewellery is often found in designer galleries around the UK and is usually very expensive due to its exclusivity. This necklace boasts very high standards of designer styling inspired by nature. It features both enamel and peacock pearl detail that sit either side of the 4cm drop silver lozenge. This lozenge is the same lozenge as featured on the bracelet. The wire itself measures 16 inches.